Families file in to see a performance of The All American Magic Show at Mall 205 in Gateway. 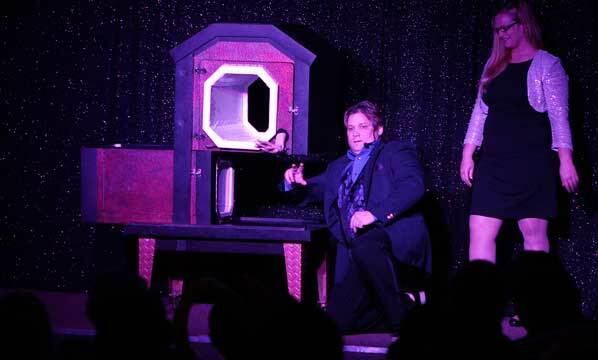 Magician Mark Benthimer is on a journey has taken him from a kid working the children’s party circuit in California, to opening for rock legend Sammy Hagar at his new millennium concert in Cabo San Lucas, Mexico. He grew up in Phoenix, AZ; then his family moved to Northern California as he was just becoming a teenager, Benthimer told East Portland News. 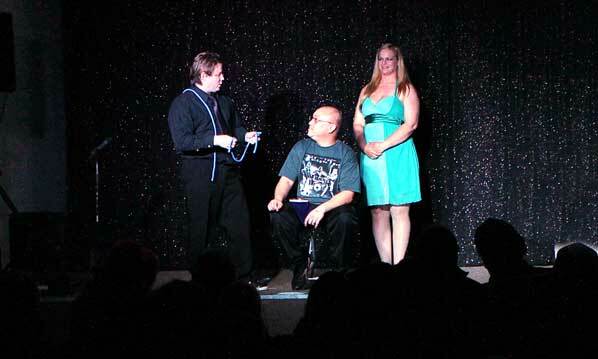 With a volunteer on stage, magician Mark Benthimer performs his famous “Professor’s Nightmare” rope illusion in front of a sold-out audience at this Mall 205 theater. Benthimer came to Portland in 1990 and started the Magic Fest magic shop – actually a kiosk, and later a storefront – in Beaverton Mall. 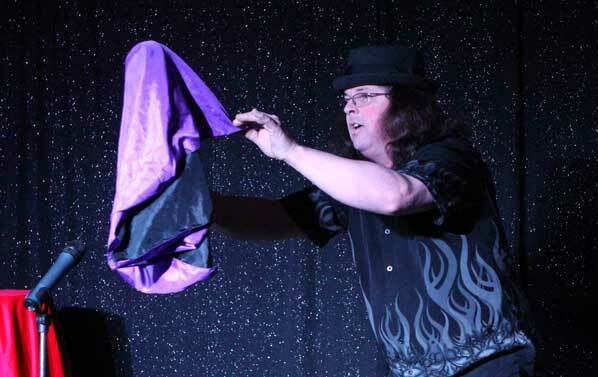 He produced magician’s festivals, attracting top names in the art to Portland; and performed for years as the “Marlboro Magician” before hooking up with musical acts like Sammy Hagar, who hired him to produce illusion shows at his Cabo Wabo Cantina in the Mexican resort town. Benthimer concludes his routine, “All from this little paper bag”. So, what’s he doing putting on shows at Mall 205? 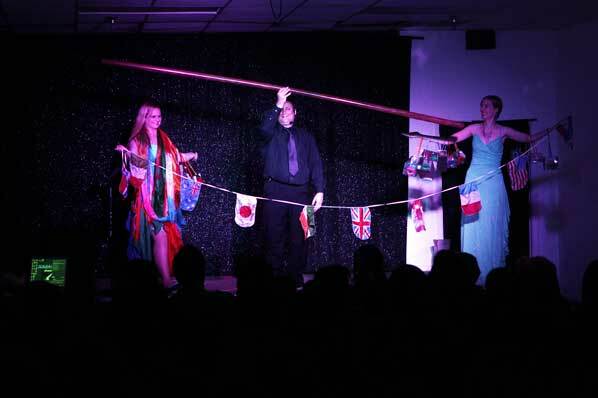 “I’ve always wanted to set up a theater that is exclusively devoted magic and family entertainment,” Benthimer said, while backstage at his “All American Magic Theater”, preparing for the November 17 shows. After Beaverton Mall closed for remodeling, he moved to Jantzen Beach Mall. “We gained the use of an empty storefront as a magic theater, Benthimer recalled. 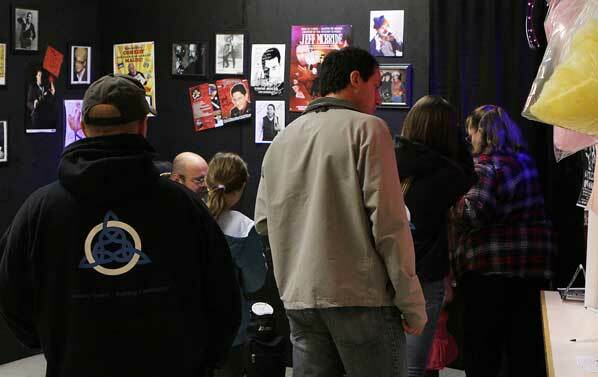 “That’s where we started doing family shows, every month during the year – drawing thousands of visitors into the otherwise pretty much vacant building. With four swords thrust through the basket, and a wooden stake shoved in the top – what’s become of his assistant? With blades removed – and after a magical incantation – Benthimer helps Amber Catlin back out of the Basket of Doom. But, as with many malls built in the 1960s and 1970s, the management decided to tear down the existing mall building to make way for additional free-standing stores and retail strips. “We moved into Mall 205 in June of this year,” Benthimer said. One of the Pacific Northwest’s top family entertainers, Scott Davis, captures a huge soap bubble, and commands it to float under the cloth. What audiences get is a fun, live two-hour family-friendly show for about the cost of a movie – with free parking, and $1 snacks. 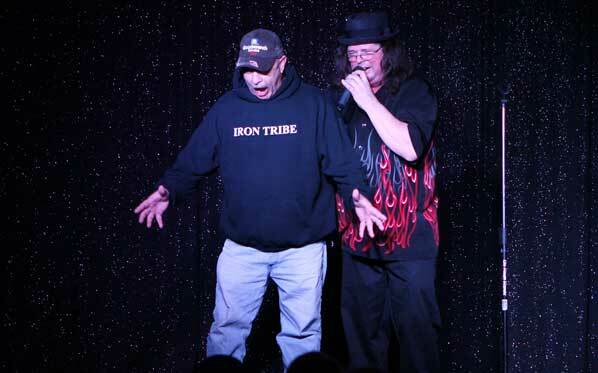 When Scott Davis gets an audience member to become a “human ventriloquist dummy”, his hilarious routine makes both adults and kids laugh until they cry. From his own point of view, Benthimer says, he enjoys the 250 seat theater more than playing in a huge auditorium. After being sliced, hole-punched – and disassembled – in this small box, Angela Davis reassures the audience she’s still in there, with a wave of her hand. As guests filed into the show, some grumbled that the “theater” was simply once a vacant store – now filled with seats, with a stage up front. At intermission, and after the show’s conclusion, it’s clear they’ve forgotten about any reservations about the room. 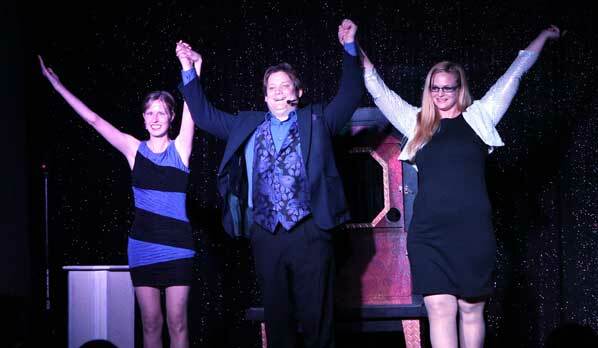 Taking a well-deserved bow are Angela Davis, Mark Benthimer ,and Amber Catlin. 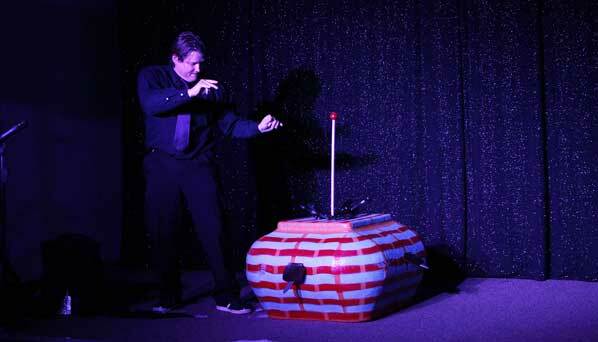 The All American Magic Show will take the stage in the theater again at 2:00 p.m. on Saturday December 29 and on Sunday December 30. Here’s a tip – get there early to be assured of a good seat. They don’t sell more tickets than they have seats – so don’t wait until the last minute, or you may miss the show altogether. For advance ticket sales, stop by the “All American Magic Shop” kiosk inside Mall 205 (9994 SE Washington Street, or call (503) 995-7379.